Getting a biweekly produce box from Home Sweet Home is always a fun adventure – you never know what might be in there. It’s also a great learning opportunity, to discover what vegetables grow well locally. Turns out daikon is one vegetable that grows well in the Prince George area, and it started showing up on a regular basis with the rest of my veggies. What is daikon? It’s a juicy, crunchy, peppery Japanese radish. You may have seen it pickled with sushi, or topping a banh mi sandwich. It’s also a good source of Vitamin C, and like any vegetable, will add some fibre to your diet. I was definitely familiar with daikon, but had never cooked with it before. So I sent the great ladies of Home Sweet Home a message to ask for their recommended recipes, and lo and behold, they had just done a blog post on daikon. It was the perfect place to start to get some inspiration. I loved their idea of making an Asian inspired rice bowl with their daikon, but wasn’t sure I wanted a cold dish with raw daikon. Even though it’s flavour is mild, I still find the peppery flavour can be overwhelming when you are eating a lot of it. So I decided to create a quick veggie and ramen bowl to pair with some leftover orange-miso glazed salmon. It was super quick to make – I was able to chopped, cook, plate, and eat this even on a weekday when I came home from work for lunch. It used seasonal veggies – I love when I can make meals that use a variety of veggies from my produce box. It was filling – hello copious veggies, noodles, and protein. It tasted awesome – because who wants to eat something that doesn’t taste good! Basically, this simple lunch encompassed all the things I like in a good quick meal. So thank you Home Sweet Home for giving me daikon and inspiration for a quick, tasty, and nutritious meal. Now go out and get yourself some daikon and get cooking! 1. Cook ramen per package directions. Drain and set aside. 2. While ramen is cooking, heat avocado oil in a skillet or wok. 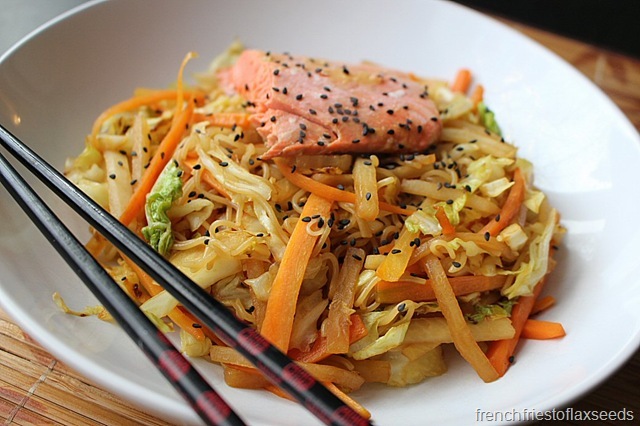 Add cabbage, carrots, and daikon and stirfry for 5 minutes – cabbage should be softened, while the carrots and daikon will still be a little crisp. 3. 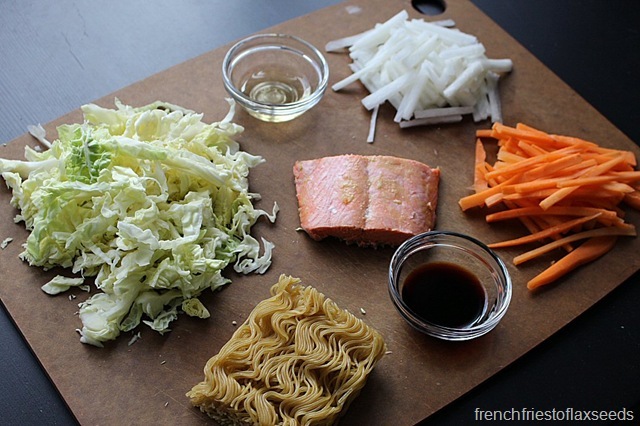 Add cooked ramen, soy sauce, rice vinegar, and sesame oil. Toss together. 4. 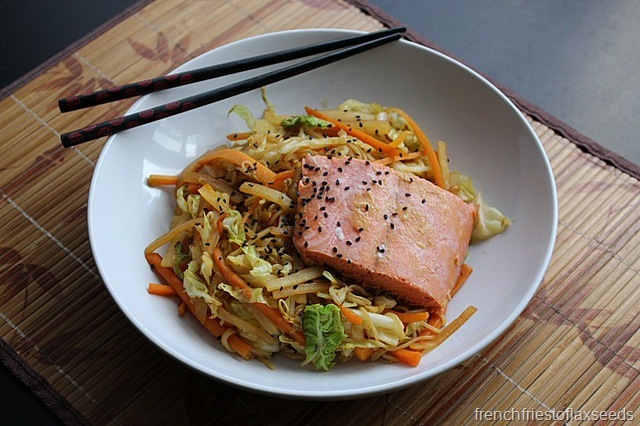 To serve, place vegetable/ramen mixture in bowl, and top with cooked salmon. Sprinkle with sesame seeds and enjoy. 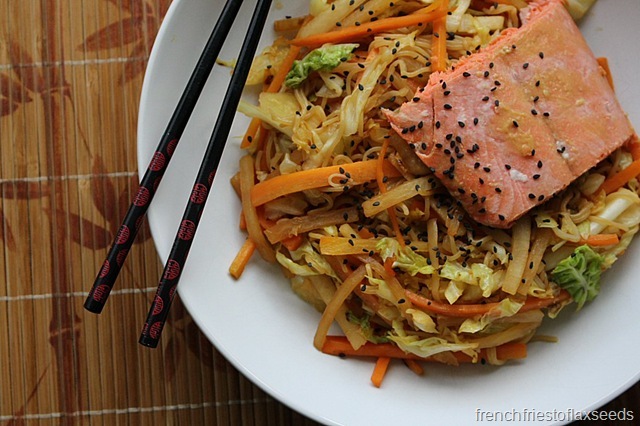 Note: This is a great way to use leftover cooked salmon. You can either eat it cold or reheat it. 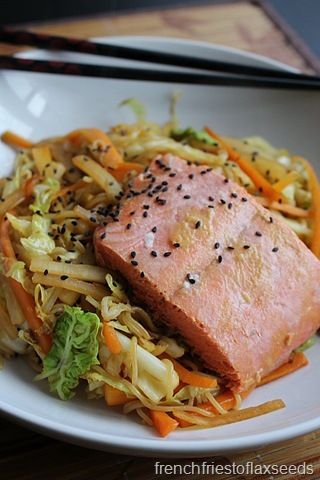 If you don’t have salmon, use whatever seafood you like, or try a poached egg or tofu. 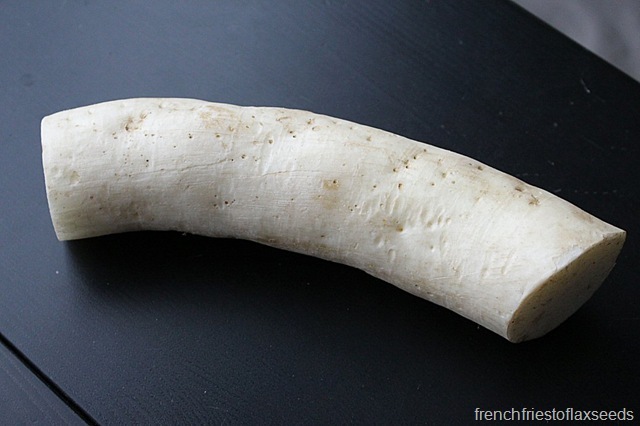 Have you cooked with daikon? What’s your favourite way to use it?